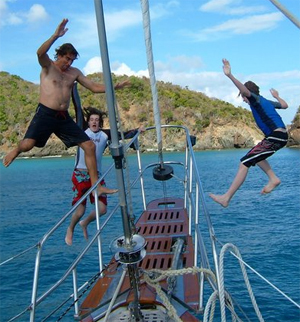 Enjoy a Sailing Yacht Charter on this 62' Caribbean Virgin Island Yacht. While on your Caribbean Yacht Charter you'll appreciate how well her sleek hull cuts through the water as you explore many Caribbean island destinations. From the minute you step on board, you can tell that this Caribbean Yacht Charter was designed with luxury cruising in mind. For those who love the open sea, this luxurious Virgin Island charter vacation will delight you with fine food and various types of water sports plus this luxurious accommodations. This Caribbean yacht charter offers comfortable accommodations for two couples or a family in unusually spacious guest cabins to enjoy a sailing yacht vacation. The aft suite has a king size berth equipped with private head and shower. 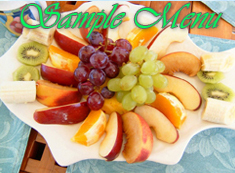 Caribbean Yacht Charter vacations of four guests will find this luxurious charter yacht elegantly appointed and especially spacious and comfortable. The crew, Charlie and Carolina, are well experienced world sailors. If you enjoy water sports, fun in the sun, you can't go wrong with its' long list of toys, which stow away neatly to leave an abundance of space on her flush teak decks so you stretch out and soak up the virgin islands tropical rays on your Caribbean Yacht Charter. 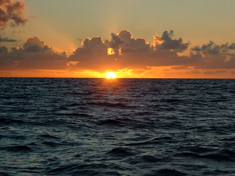 The beautiful warm waters of the Caribbean & British Virgin Islands are often called the Mecca of sailing in the world. 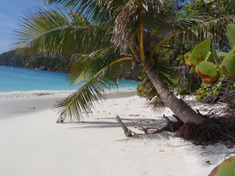 Caribbean Yacht Charters on Crystal Clear will uncover natures little secrets. Imagine sailing to and exploring uninhabited Caribbean islands, snorkeling or simply relaxing in a hammock reading your favorite book or enjoying the beautiful sunsets. Discover the rich culture of the Caribbean by dancing on the beach to the sounds of a traditional steel bands. 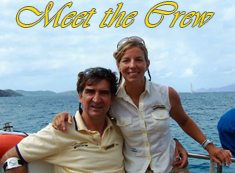 Charlie and Carolina are looking forward to making your Caribbean yacht charter vacations a truly magnificent affair. 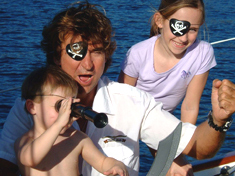 See what some of our previous guests had to say about their memorable Caribbean yacht charter vacation. 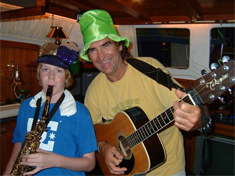 Captain Charlie and Carolina is the perfect couple to be around during your yacht charter vacation, at times Charlie he pulls out his guitar and sings for guests. Carolina is brilliant with people and your cuisine. 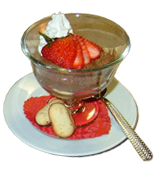 Carolina, a passionate chef, takes great pride in serving her guests gourmet meals of international flavor, freshly prepared with the finest ingredients. Their extensive traveling has only served to broaden her culinary horizons. What better way is there than to relax on board a private sailing charter yacht and enjoy the shining sun and crystal clear blue waters of the Caribbean? Once you sink your toes into the beautiful warm white sandy Caribbean beaches, you'll want to explore the culture and discover paradise. With more than 36 islands and cays, Virgin island yacht charters offer beautiful white sandy beaches, excellent restaurants, nightlife and numerous water activities for your sailing vacations.